Plants often forming loose-lying (and sterile) globose tufts several cm in diameter. Filaments uncorticated, forked at intervals of one to several segments, the branching subdichotomous. The lower segments with occasional rhizoids given off at both ends of the cells. Cells from 15 µm apically to ca. 300 µm in proximal parts, the length varying from ca. 30 µm apically to over one mm basally. Reproductive structures rarely seen, tetrasporangia single, pedicellate, inserted at the upper end of cells. Sexual reproduction of South African material only known from the M.A. Pocock collection, on what would appear to be young plants: Female fertile filaments four-celled, the carposporophyte hemi-globose with two auxiliary cells developing. Involucral cells originating from the hypogenous cell (one) and the subhypogenous cell (five to seven). In South Africa is restricted to a few estauries, from False Bay to the Port Alfred area (17-39). Apparently limited to (slightly) reduced salinities or sheltered habitats. The (early) finds of M.A. Pocock are among the very few world- wide that can claim to show the sexual reproduction of the species (Stegenga 1988). Worldwide distribution: widespread in the Atlantic and Mediterranean, also reported from California and Japan (Guiry & Guiry 2015). Type locality: Amalfi, Naples, Italy (Agardh 1842 in Guiry & Guiry 2015). 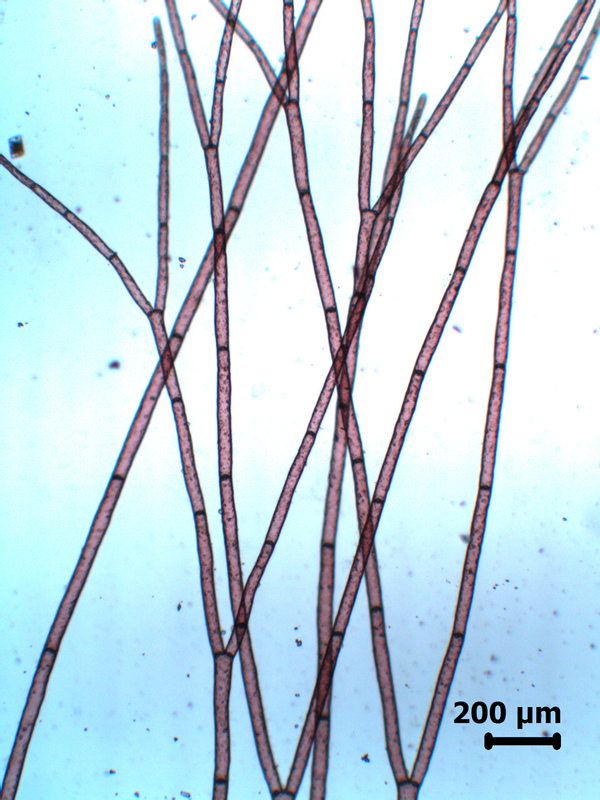 Anotrichium furcellatum, thallus apex. Reproduced from Stegenga et al. 1997. 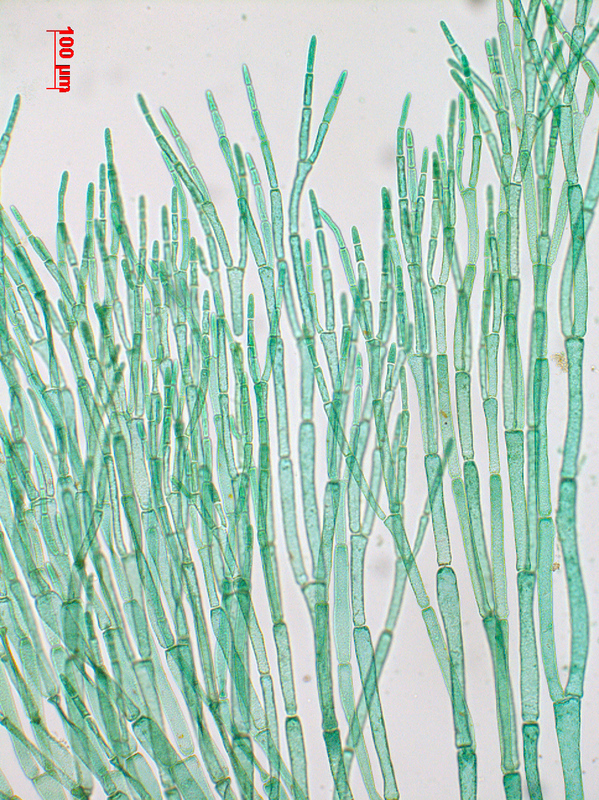 Anotrichium furcellatum, micrograph of fresh material. Anotrichium furcellatum, stained slide material, Kowie (not fertile). Baldock, R.N. 1976. The Griffithsieae group of the Ceramiaceae (Rhodophyta) and its southern Australian representatives. Australian Journal of Botany 24: 509-593, 92 figs. Stegenga, H. 1988. Notes on the Ceramiaceae (Rhodophyta) from the eastern Cape Province, South Africa I. New records and remarks on morphology. Blumea 33: 371-393.